Samsung Galaxy S10 is still months away for the official unveiling and is expected to bring a lot of new features over its predecessors which include improved screen to body ratio, an under display front camera and more importantly its said to be launched in 3 variants. 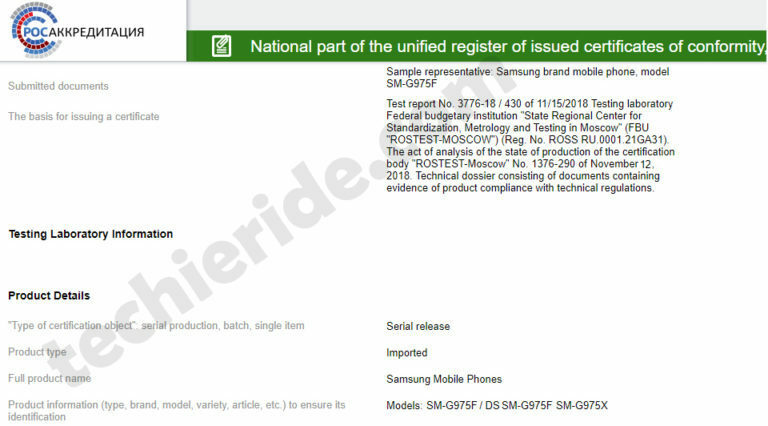 Now toady the largest model of the Galaxy S10 trio has been spotted in certification process in Russia. And as the typical certification document leaks there is only minimum details leaked about the devices. According to the certification documents the SM-G975F and SM-G975X model numbers are once again listed ,indicating that this particular device is the Galaxy S10+. There is also another variant listed as the DS SM-G975F confirms that a dual-SIM version of Samsung’s most expensive Galaxy S10 model will also be available for purchase yet as usual the availability may vary by market. Samsung Galaxy S10+ is set to arrive with a new 6.4-inch Infinity-O display that offers a very impressive 93.4% screen-to-body ratio and would be powered by either Qualcomm’s Snapdragon 8150 or the Exynos 9820, depending on the region. These new flagship chipsets will be more powerful and efficient than outgoing processors, thanks to the new 7-nanometer process. However, by combining this efficient chipsets with significantly larger 4,000mAh battery the Galaxy s10 would be able to provide better battery backup than the Galaxy S9+ which uses a 3,500mAh battery. According to the early reports, Samsung has planned three Galaxy S10 models for 2019 following the 2018 iPhone series. Out of the three Galaxy S10 models, two models will feature a curved edge panels while the more affordable model would feature a flat display.